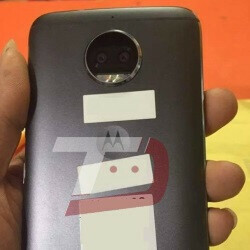 Just a week after noted leakster Evan Blass shared details about the Moto G5S Plus, two live images of the handset surfaced online. They give us a good "in-action" look at the upcoming smartphone, even if the latter is still covered in stickers and obviously still being prepared for a soon-to-be reveal. According to Blass' report and all the leaked evidence supporting his claims, the reported changes from the original Moto G5 Plus are both cosmetic and technological. For starters, the smartphone is now made of aluminum, no longer making do with a plastic back. What's more, a dual camera (two 13MP sensors, one color, and one monochromatic) has been added, the front camera has been upgraded to 8MP (from 5MP), and the display has been enlarged to 5.5 inches by diagonal. Logically, the smartphone has grown slightly bigger than the original, too. The new dual camera is said to deliver functionality like bokeh, background replacement, and selective black-and-white filtering. This will let you get more experimental and creative with your photos. But these specifics aside, the hardware configuration has been copy-pasted. The screen resolution is still 1080 x 1920 pixels, and the smartphone is powered by the Qualcomm Snapdragon 625 chipset with up to 4GB of RAM and 64GB of built-in storage. Of course, that should be more than enough for comfortable everyday use, though heavyweight 3D games might not run as smoothly, or look as sharp as they would on a more premium handset. By the looks of things, the Moto G5S Plus' announcement could happen very soon. The company has an event scheduled for July 25 in New York, where the Moto Z2 Force and Moto X4 are, reportedly, to be announced. The Moto G5S Plus could be revealed at that event, or at a later date. This is nice... the price will say if it works for the consumers or wont... also that moto branding? why? arent these people motorola already? Uh, kind of a dumb question. It's because Lenovo bought Motorola's smartphone business from Google three years ago. They debated re-branding the phones with Lenovo's name. Yes kiddo but their branding has been "motorola" again all over the world for weeks, they should use it on the phones as well already.